It’s late in Tokyo and you're hungry. We understand. Here are the best Tokyo ramen shops open after midnight and located within striking distance of the city’s major nightlife areas. Of course, there are many mid-grade chain ramen shops open late in these areas, too. But if you want the best-quality ramen available in the wee hours, try these spots. For local party heads, Kaotan is an institution. It’s more of a shack than a shop, with interior seating that often places you side-by-side other customers at a communal table. Be prepared for amusing late-night encounters. The shop has an old-school feel and the ramen is simple and comforting — a clear shoyu with medium depth, served with onions and simple toppings. Canned beer and chu-hi are also on the menu. This shop is known for its kogashi miso bowl, featuring a blackened miso soup. They also serve a respectable tonkotsu. The shop looks and feels somewhat like an izakaya and has a late-night following. A bit nicer than your standard ramen shop, it's also viable as a late late-night date spot. There are a few other branches of Gogyo but this one seems to be their flagship. Ichikoro debuted just a few years ago but already boasts several branches, including one in Spain. Velvety chicken soup that goes down smooth is the main draw, with both ramen, tsukemen and a plethora of topping options on tap (try the aosa seaweed). The tori chashu gets a ‘156’ branded/seared into it, which is a play on words referencing the shop name ('ichikoro' sounds like 156 in Japanese). The side menu also is impressive with some izakaya-like fare and a decent beer selection. Friendly staff too. Not particularly renowned during daylight hours but known on the late-night circuit for years amongst party heads, Kazuki serves Tokyo-style shoyu ramen laden with seabura (pork back fat). The recommend bowl is the seabura spicy miso or the seabura shoyu. Kazuki was originally opened by a former taxi driver and has relocated numerous times during the years, but now sits less than one minute from Roppongi crossing. Easy access for tasty drunk ramen served past sunrise. Afuri has expanded rapidly in recent years, growing from one shop to over ten. The brand’s biggest asset is its shops' locations in central areas — Harajuku, Roppongi, Ebisu and more — where expensive real estate has priced-out the most cutting-edge ramen competition. During day-time hours we might point you elsewhere, but after midnight Afuri’s light yuzu shio and shoyu options are fully worthy of a quick fix. The address listed below is the flagship Ebisu branch, but look for Afuri shops in central areas throughout the West side of Tokyo. Shinbusakiya serves a very respectable bowl of Sapporo-style miso ramen, right in the heart of Shibuya. This shop isn’t going to win any awards, but if you want miso after midnight in central Tokyo this is your spot. Located practically next door to one of Shibuya’s more infamous night clubs and just a stone’s throw from the seedy love hotels and massage joints on Dogenzaka hill. There's nothing particularly outstanding about Chorori, but we find ourselves coming back here again and again. The shop's comforting, old school shoyu ramen and late-night hours make it a favorite amongst locals. We recommend the shoyu ramen, but shio ramen and wontonmen are also served, along with cha-han (fried rice) and gyoza. The soup has a strong aroma of roasted onions – quite similar to Kaotan in Minami-Azabu. The toppings are unexceptional, but certainly tasty. This bowl just simple, old-school shoyu ramen – perfect with some gyoza and a beer. The shop always seems to be packed out with regulars, too. A nice late-night option in Ebisu. The flagship tonkotsu branch for the well regarded Nagi ramen group, Nagi Butao serves up Hakata-style bowls with kaedama extra noodles and all the fixins’. If Kyushu-style tonkotsu is your thing, you really can’t go wrong here. Toride’s master, Nakatsubo-san, was one of the original staff members of the head Ippudo flagship in Fukuoka, where he trained for 13 years. 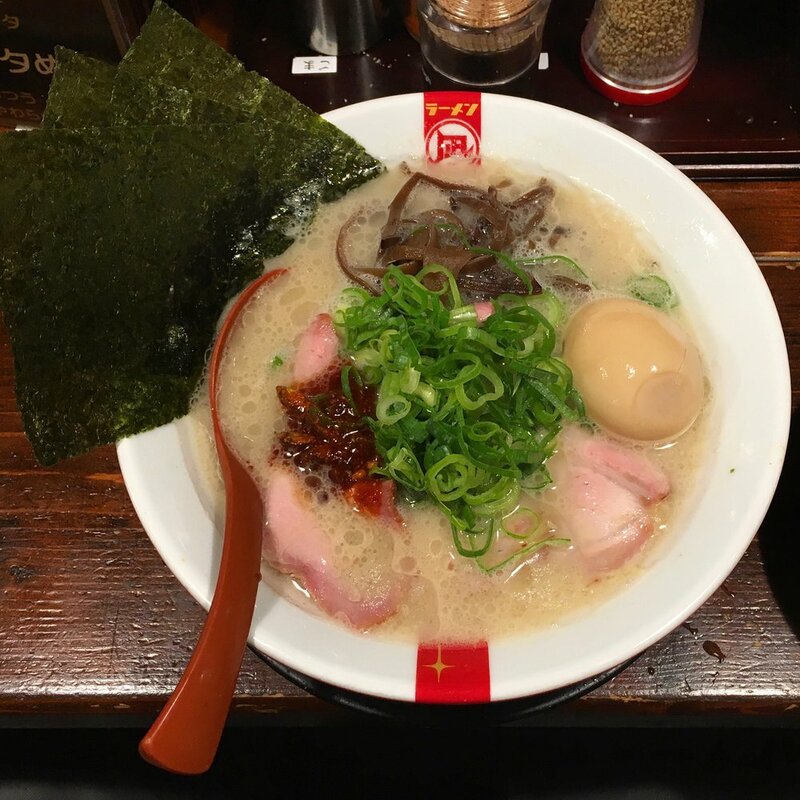 Having learned the ramen trade at the shop that went on to become a tonkotsu behemoth, he has since opened his own fine establishment in Shinsen-Shibuya. Aside from the classic Hakata-style tonkotsu that you would expect from an Ippudo disciple, there is a nice tsukemen on the menu and the occasional seasonal and limited-edition offerings. The noddles are homemade; everything's served fresh and high quality. A much respected niboshi powerhouse, Nagi Golden Gai is open 24/7/365 and located in the heart of Golden Gai, the famously well preserved section of Shinjuku where over 200 tiny nomiya and snack bars are packed into the space of a single city block. The shop serves a deep, pungent niboshi soup (made from dried baby sardines), with handmade noodles thick-cut to various widths, diced onions and other choice toppings. A an excellent bowl, available non-stop year-round. Takahashi serves a unique shio ramen with a soup made from agodashi — flying fish that are both dried and grilled before a slow boil to make the soup stock. The shop offers both a light, clear version and a slightly thicker option served with seabura. Both bowls have nice balance. The agodashi is lighter than your typical fish soup yet still umami-rich. A bit under the radar but worth checking out. This shop is all about late-night, spicy, Chinese-style tantanmen in central Tokyo. Get your bowl topped with some deep-fried sizzling pork cutlet (aka Paiko), or opt for a side of plump gyoza and some rice. A solid spicy drunk bowl. Chiranai Sakura sits almost under the train tracks near Okachimachi station. The decor is bright, flowery and cheery — cherry blossoms and colors splashed on the walls and staff (all young women) wearing colorful yukatas. The girls are genki and there is usually traditional Japanese music playing. This shop is part of the excellent 'Bond of Hearts' ramen group led by Tsukada-san, a legit beast from Nagano prefecture. Chiranai Sakura serves a few different varieties of shoyu-based ramen, gyoza, beers, fried rice, and other surprises, all of which you can purchase from the ticket machine near the entrance. Our recommended bowl is the 'osama chūka-soba,' which comes with the shops’ standard shoyu soup decked out with sliced negi topping and loads of black pepper. The negi and black pepper give the bowl a great kick and pair well with the soup. Everything on the menu is solid. Thumbs up. If you have a car at your disposal and time to kill, take a drive out to Tanaka Shouten deep in the Tokyo suburban outskirts of Adachi-ku. This shop has long been known as one of the best (if not THE best) shop serving Hakata-style tonkotsu ramen in Tokyo. The bowls here are exactly as you would find at top shops in Fukuoka — creamy pork bone soup, kaedama noodle refills and free toppings on the counter. The huge, 36-seat shop is open every day until 4am. Hakata-style at its finest.